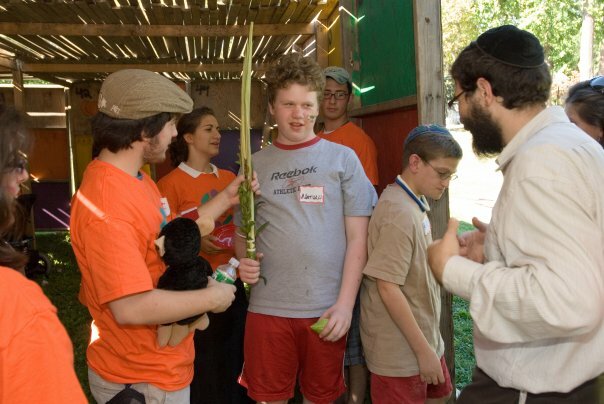 Friendship Circle volunteers helping a child shake the Lulav on Sukkot. Sharing a smile with those in need. As a Shomer Shabbos junior in a highly competitive high school, I strongly value my Sundays, the one time a week when I can dedicate an entire day to my personal needs. And yet, almost every Sunday of the school year I find myself once again surrounded by the same people. This group includes Jewish children, teens, young adults, and parents, ranging in ages from three to sixty years old. But this is no ordinary group of people congregating to satisfy another routine need. Each person in this group has a special focus: helping a child with special needs. This group, Friendship Circle, was first started in Detroit by Chabad with the sole purpose of helping the families of children with special needs. Its ideas and goals have branched out and reached Philadelphia, where its own staff, volunteers, supporters, and families are now involved in a series of activities designed to help the families in need. 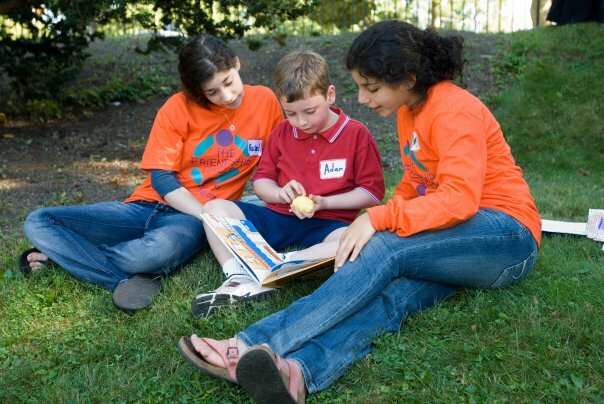 These activities include Sunday and Holiday activity sessions, or "Circles", where the children interact with teen volunteers, home visits to children by volunteers, Bar/Bat-Mitzvah preparation for the children, training sessions to better familiarize and direct the volunteers, and support groups for the children’s parents. The children and young adults with special needs range in ages from three to twenty three or four, with diagnoses in severities and symptoms ranging from a slight developmental disability to near paralysis. The part the children play may seem simple - show up and have fun. However, this one trek from their houses may use up much of their energy, not to mention near all of their parents’ energies. The part the other teen volunteers and I play is simple, but not ordinary, and sometimes a bit nerve-racking: being a friend. The first question that popped into my mind upon hearing my purpose was: How am I supposed to be a friend to someone who may have trouble telling his parents what he wants for dinner, let alone communicate with a complete stranger? But with the help of excellent staff, training sessions, and other volunteers, I quickly learned to look forward to each and every session. It is hard, however, to become so involved in something that could be so uncomfortable. Perhaps for this reason, Friendship Circle pays almost as much attention to its teenage volunteers as it does to those directly affected by the special needs, showering us with food at every turn, gifts, and special volunteer-only trips and events. And while originally these rewards definitely helped to motivate my return to the events, if for some reason these perks now came to an abrupt halt, I would still go, and look forward to, every Circle possible. Two Friendship Circle volunteers reading a book with a child at a Sunday Circle. What is it that I love so much? I certainly love seeing the other volunteers in the half hour before the kids show up, but these are not the only friends that I can depend on seeing every session. I have grown to love hanging out with my friend with special needs. And though she doesn’t necessarily show appreciation, or even recognition that she’s ever met me before, I know that I am being helpful to her parents, and hopefully I help her as well. In a line-up of activities arranged by those in charge, I go with her from music to art to snack to motion, trying to go beyond simply involving her and to help her have fun. She surely receives plenty of attention outside of Friendship Circle – she goes to all sorts of specialists and doctors. Her parents are completely dedicated to her care and love her to no end. But her parents cannot buy her a friend. And that is why I am there – to be the friend that she does not necessarily have the skills to make on her own. Not just anyone can give me the experience of hanging out with someone completely different from myself, broadening my horizons and really teaching me about the importance of life. In a world filled with an array of valid global concerns, we tend to forget about those groups and individuals within our own communities who are in need. My special friend reminds me of the really important things in life and that not everyone is what they seem to be. Because for all her difficulties – and she has many, many more than anyone I’ve ever met – she is a distinct, wonderful person. Though it may seem that she is the only one benefiting from our relationship, she and the other children have taught me much about the need to pay attention to each individual and to take nothing in life for granted. This program is continuously growing. If you know of a family with a child who has special needs, a teenager who would like to volunteer, a sponsor, or someone who might be available to drive a teenage volunteer who can nott find a ride to an event, please contact zev@phillyfriendship.com. For more information about the Friendship Circle, please visit its website.